The spectrum calculation has been carefully designed to provide a coherent, statistically reasonable result that works consistently for many different types of data. 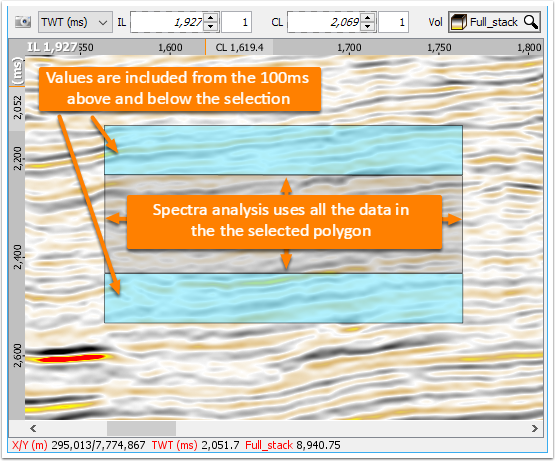 In the specified region, every sample is retained for spectral analysis. Above and below this window, an additional 100ms of data is sampled and ramped to zero, with empty samples at the window boundaries excluded. 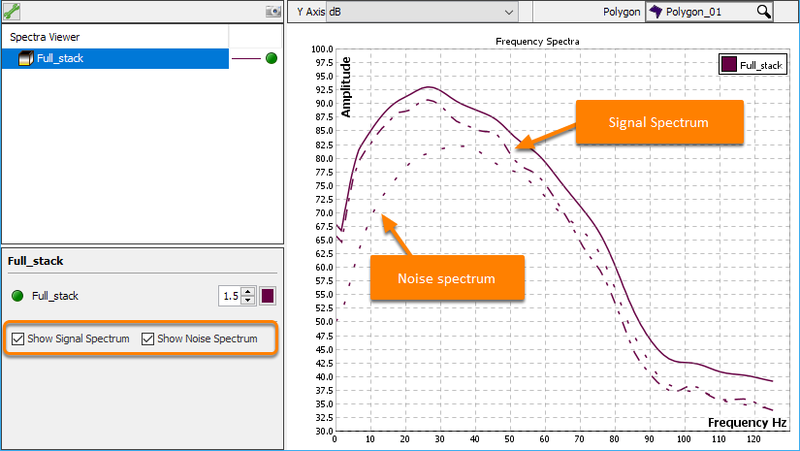 The spectrum for each prepared trace is calculated, smoothed and resampled to a 1Hz increment. Using this approach, the smallest possible sampled region is 200ms, assuming no empty samples or data boundaries. The spectral resolution is dependent on the number of samples in the window. For the minimal window case at a 2ms sample rate, 100 frequencies can be calculated prior to resampling. For larger windows with more samples, the spectral resolution increases accordingly. This results in a spectrum that is reasonable for the data, without suffering from edge effects or bias from limited window sizes. The example above shows the signal and noise spectrum for a single full stack. By default, the signal and noise spectrum options are always enabled (check/uncheck the Show Signal or Noise Spectrum box to enable or disable them). To generate the signal and noise spectrum, each trace's Fourier transform is calculated, then correlated against itself and its neighbour (the next trace). Signal is taken to be the real part of the cross-correlation; noise as the autocorrelation minus the signal. Signal and noise are averaged over the entire panel of traces. Note: The vertical scale can be configured by right clicking in the view and selecting Configure Track. At Scaling, select Linear, Log or Octave to display the curves in the track in the respective axis space.